Can you advise, re: the enclosed picture, who is the lady with large leaf behind her head. We often see it on menus, one is enclosed, and do wonder what she is holding? 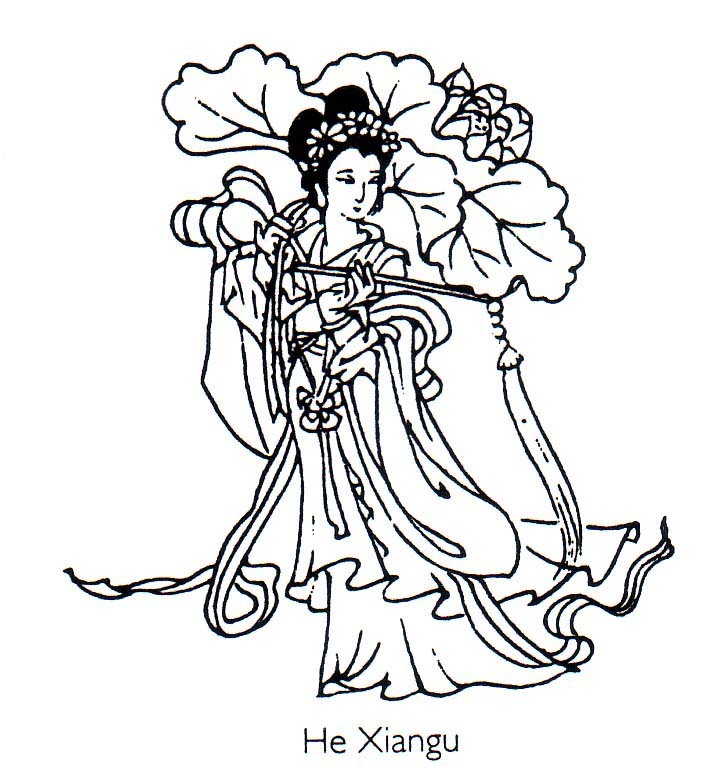 Can you tell us something about her and if she is a Chinese god? 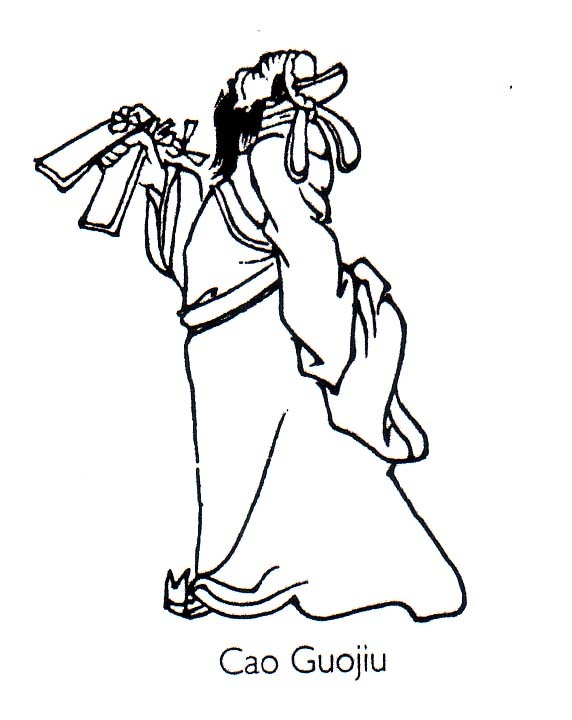 Zhongli Quan is said to be the leader. You can recognize him as he carries a magical fan. Also found on cards, even a restaurant menu or two, and elsewhere are three folk known as gods, not immortals. 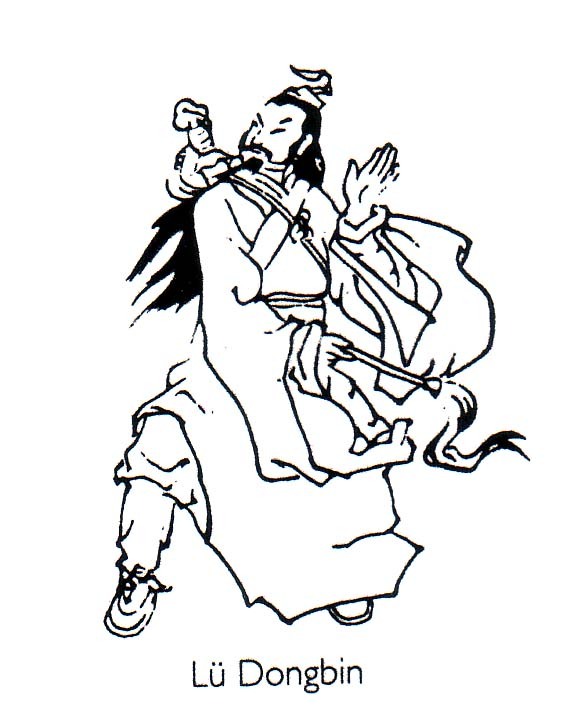 The first of these is the God of Long Life, more often called the God of Longevity. He and the other two are known as the three Sandou or �Plenties.� They are often seen together in ceramic, as figures on a shelf in a home or in a restaurant. Their names are Fu, Lu, and Shou. It is common to place an offering of oranges and incense before them. They have the power to effect health, wealth, and longevity, respectively. 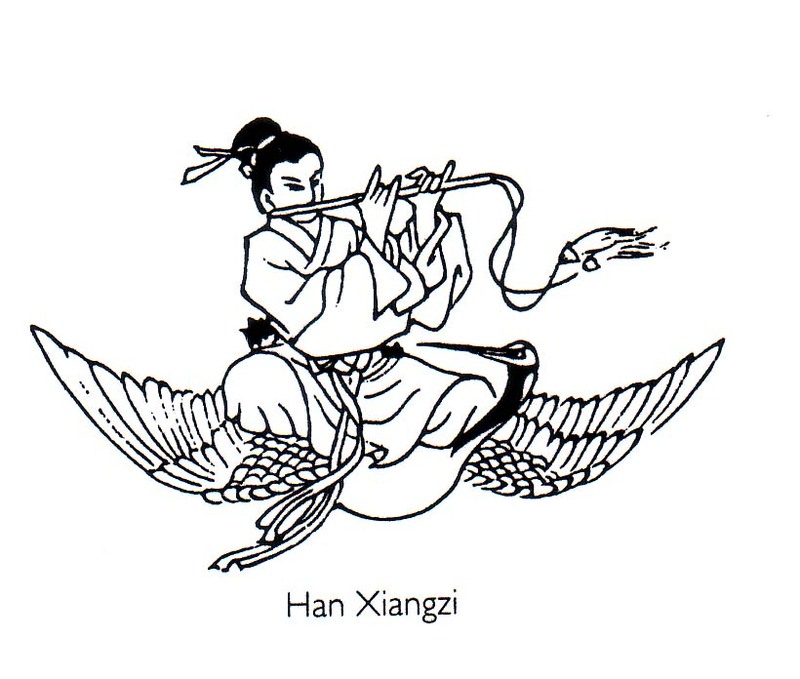 These days, they are more popular than the eight immortals. Why was there no gorgeous picture of Chef Lee�s business card or place of business in Columbus GA in your review of that restaurant? As a former resident of the town and a former customer, it was missed by me and many in my family. We used to frequent the restaurant often before we left the country. 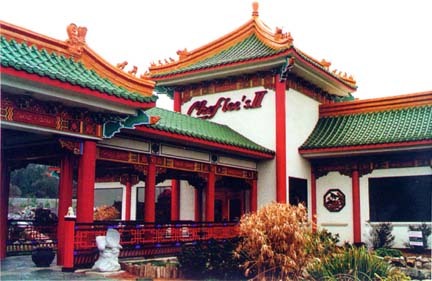 LARRY, CHEF LEE, and OTHERS:: The article about Chef Lee�s Peking II restaurant was not intended to be a restaurant review. It was to show how restaurant reviews are done. When we did it, we thought putting a picture there would give the wrong impression, so we did not. Furthermore, adding insult to injury, when we visited we arrived in very gloomy weather, and the photographs we took did not turn out as we might have liked, were we to use them. In our opinion, Chef Lee�s card does not do it justice, either. We asked and were granted permission from the editor of Chinese Restaurant News (CRN)to use their gorgeous color photo. We did reproduce that and the newest restaurant business card. The color one, though only a partial view of the restaurant, and the brown one are both from the second and newer restaurant this chef owns. In the hard copy, we included both, and advise that the color picture is from the cover of the January 2005 issue of CRN. For those who do not know about that magazine, it is a Chinese Language magazine distributed to more than forty thousand Chinese restaurants. Each month one eatery is featured, and Chef Lee�s Peking II was selected for that January. To THE COMPLIMENTORS: Thanks for all your compliments; we loved them all. As indicated by the above and many more wonderful words, most love the new look. We agree that Dalia is correct. The problem occurred at the last minute and so we had to color each copy by hand. Future issues have fixed that. We hope you and others agree. And to Bryan:: We would like to point out that you are not reading a newsletter, and that you are not alone to call it one. We and other media professionals refer to Flavor and Fortune as a quarterly magazine. Loved your detective work on cheese powder. I had always noticed the omnipresence of Bird�s custard Powder in Chinese stores. Great recipes. I take it the powder is used as a simultaneous thickener and sweetener (cornstarch and sugar). Is the color also important? Do you have any recipes with simple ingredients that I could get here in Mexico? I love pursuing the new uses of old ingredients. RACHEL: Bird's Custard Powder was discussed in Volume 12(2) on pages 27 and 28. We never saw this product in a Chinese store. Had we, would we make this correct conclusion? Not sure. 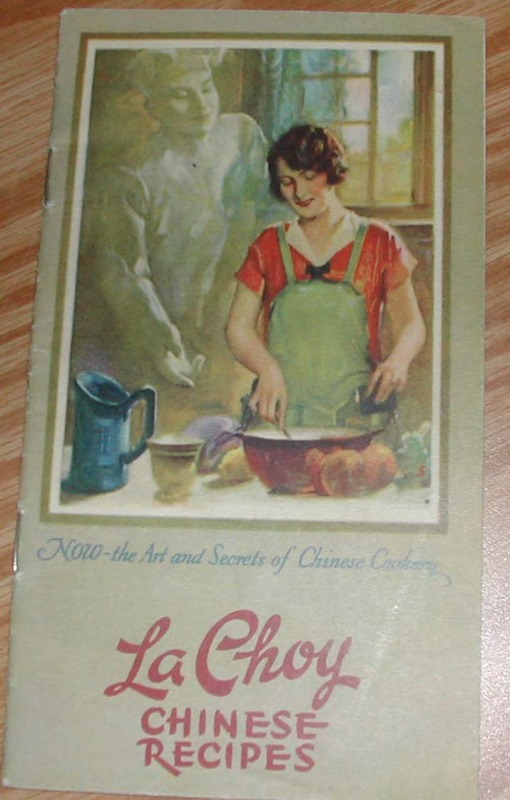 To you and others who wanted more/other recipes and/or knowledge as to where/why those selected, be advise, they are typical and come from Taiwanese and other Chinese cookbooks. Our kitchen detective work shows this powder works well in place of a thickener, and does make light-colored foods look richer. On your own, try it as a substitute, one for one, for cornstarch. Leave out sugar, if it is called for. Below is an additional rather common recipe, but with a twist, to better understand its use. You might be interested in informing your readers about SPIRAL, which stands for Selected Patient Information Resources in Asian Languages. This consumer health information system is a joint initiative of the South Cove Community Health Center and Tufts University Health Sciences Library. It is supported by a grant from the New England Region of the National Network of Libraries of Medicine under contract NLM-00-101/SMS. Thank you MAR, the half of Marstan who advised about SPIRAL: Did appreciate hearing from you and others. Subscribers know we featured it in the previous issue of Flavor and Fortune on page 38. For those who missed it, you can find it on the web, or contact Amy LaVertu at the Health Sciences Library of Tufts University. The snail-mail address is 145 Harrison Avenue, Boston MA 02111. I enjoyed reading the Winter 2004 issue, and was especially taken by the article about the New Kowloon Restaurant in Seattle. Was I the reader whose recommendation led you there? LPJ: We enjoy your mail and compliments, and those of all others. You were one of several who recommended this eatery. We visit as many recommended restaurants as we can, and adore getting everyone�s restaurant suggestions. Sometimes, we contact readers for places to go to when we visit their cities. For the record, we visit many more than we review. Space is an issue as is why should we write about a place not worth visiting? Thank you and others for keeping us informed. 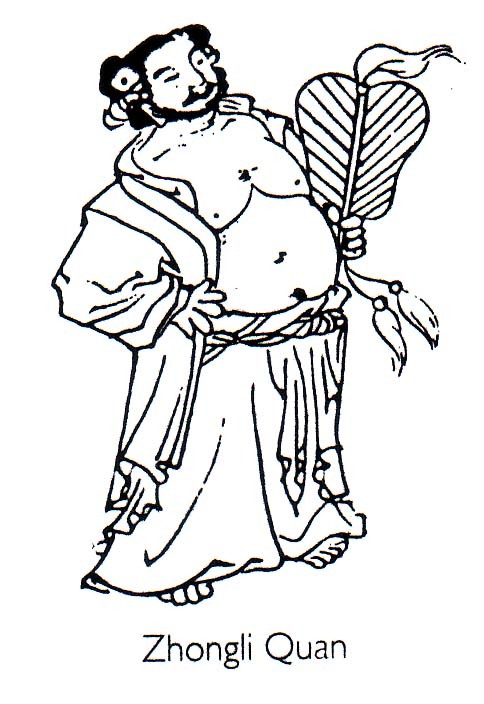 Now that you are printing in color, wonder if you would include a color picture of one or more early La Choy pamphlets. I am particularly interested in the one with the ghost, and the one with the Chinese person and the Caucasion guests. JEANIE: Pleased to accommodate. The article you refer to is: La Choy: Going on Seventy-five that appeared in Volume 11(2) on pages 5, 32, and 33. Stony Brook University�s special collection of Chinese cookbooks, donated by yours truly, graciously allowed us to photograph them before we wrote that article. We still have them on disk, so it is easy to share. What is Chinese Bunting tea? HESTER: Information is confusing, sometimes conflicting about this item which is not a tea. We found a tea bag of it on a recent cruise that answers your question, and have reproduced it in the hard copy of this issue of Flavor and Fortune. It connects Bunting to Rooibus tea. This botanical whose technical name is Aspalathus linearis is not any form of Camelia sinensis or tea even though the label says �Tee.� It is a tisane or substitute for tea. Folks seem to tout it as a tea and a Chinese one at that. Both are incorrect. 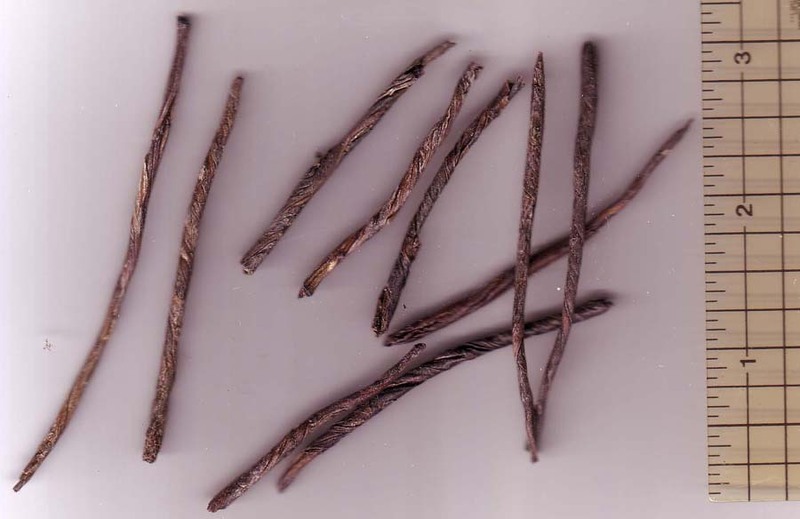 It can be bark or leaves, both harvested and processed in Africa. 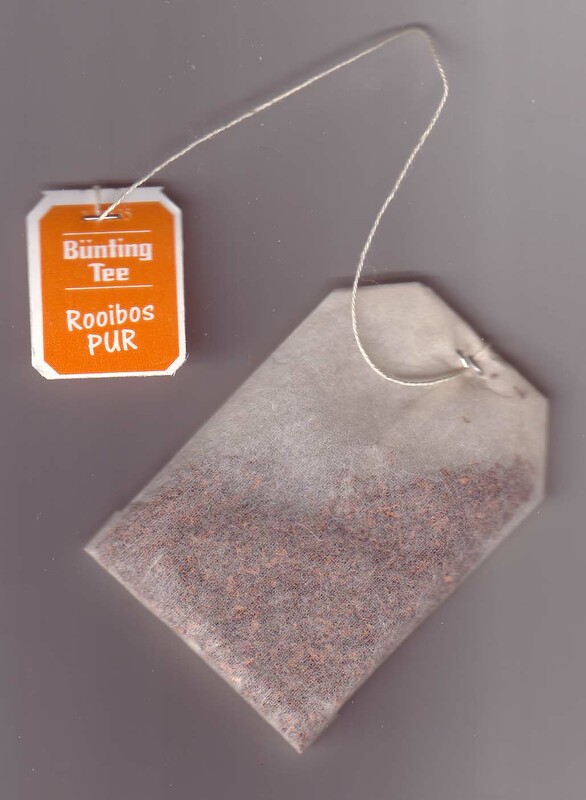 In Holland, where this teabag was packaged, the word �rooibus� means �red bush� and lots of it is packaged in that country. Maybe that is why some call it by that name, others by Bunting. This beverage, when using the leaves, is made from fermented needle-shaped ones. It brews red, as do black fully fermented tea leaves. Many tout it to boost the immune system, probably because it has lots of polyphenols. Most do not know that there are fewer of these �good for you� items in it than are in a comparable amount of green tea. Pronounced �roy-boss,� one source said it comes from a legume-type shrub, of which there are some two hundred species. Also that it has no caffeine, and it reduces stomach cramps in adults, and colic in infants. As a poultice, they touted it to help those suffering from eczema. As a tea, they also said it helps hay fever suffers; and reduces the aging process. If it works, all cultures would be proud to claim it as their own. What is Ku Ding tea? A friend called it medicinal, what is it touted for? CANDICE: Often known as Dong Qing, this is a beverage used in China. It is not made from Camelia sinensis, but rather from one or more members of the Ilex or holly family. Most commonly, this drink is made from Ilex kudingcha. However, there are some with this name made from the wax tree or a species of Ligustrum. While they can be rolled in many ways, the most common are long rolls or balls. We have only seen it as spike-shaped rolls. Ku means bitter, and it surely is. Ding is the Chinese word for spike, and the rolls really do look like spikes. Chinese herbal doctors advise they recommend this herbal beverage to clear the head, reduce the common cold, get rid of itchy eyes and headaches, improve memory, and to maintain proper body weight. This latter use is why a saleslady at a Ten Ren store we visited does drink it. She bought hers there and has been drinking it for two months. She said she no longer notices the bitterness, and that it really works. She agrees the first mouthful is bitter, but it does sweeten with continued consumption. She only drinks it once or twice a day, and for a figure like hers, I would, too. 1. Mix pork, long beans, and Bird�s powder. Then add scallion pieces, rice wine, and sesame oil. 2. Put on wonton skin on a dry board, and put a heaping tablespoon in the center. Wet two edges, and fold the wonton wrapper, also called a skin, your favorite way. We like doing ours as a triangle, then wetting and squeezing the two ends together, and set each one out on a dry platter. 3. Repeat until all are made, then boil them in water until they float to the surface. Remove with a slotted spoon, and set aside, each wonton not touching another. Note: The wontons can be used in soup, refrigerated over night, then pan fried, or deep fried, as desired.